In light of the recent events associated with Lance Armstrong, I’m re-posting this as proof that you can compete clean and win against dopers. At the time I wrote this, I knew a lot more about Armstrong than I was willing to write down. In that way, I guess I was like all the other cowardly journalists, fans and commentators who looked the other way. I’ll admit that I’ve been avoiding long rollerski intervals at Heath’s Bridge. Mostly because they haven’t fit my work schedule. But also because I was afraid my form was far behind where I needed to be, and behind the other skiers in particular. There’s nothing quite as demoralizing as watching guys slowly — or rapidly, in some cases — pull away while I’m struggling just to hold my form together and not crack or cramp up. The fact of the workout hung over my head throughout the day. I was tired from running around at work. Tired from the previous day’s intervals on the bike trainer. Plus, I was all jacked up on coffee which was contributing to the nervous feeling and competing with my body’s fatigue for attention. At some point, I was going to crash and I was only hoping that it wouldn’t happen before the workout. As I drove the backroads through Sudbury and Concord, caught in after school traffic, I was getting stressed and wondering why I do this to myself. Rushing around, squeezing in workouts in the in-between hours, the crack of dawn or dark of night. With a whole upcoming winter of this to look forward to. But then I was on the rollerskis and warming up with my teamates, Frank and Andy. We did 5 intervals on the twisting, undulating, pine cone and needle covered roads, alternating between full skate technique and no-poles skate. On the first hill of the first interval, my heart rate was pegged, but we all stayed together. On the second interval, without poles, my legs were locking up. I was really feeling the bike intervals…and the hillbounding from the day before…and the core strength, with a paricular focuson the legs, the day before that. I felt ragged and sloppy. I was slapping my ski hard against the road and dumping lots of energy. My weight was too far back. I focused on my form and kept making fine adjustments while Frank pulled away. There is some secret combination of weight transfer, impulse and body position that I haven’t quite unlocked for no-pole skate. Not yet, at least. Full technique, I felt better and better through the workout. By the final interval, Frank, Andy and I were skiing in a tight group, on the backs of eachother’s skis. Just like the Tuesday Night races at Weston. These guys are my “competition” but they’re also my training partners. We train hard. We race hard. We force one another to be a little bit better, a little stronger, each time; then we laugh and smile about it aftewards. On the cool-down, I thought about how great it was to be training with these guys, how they had saved my life, in a sense, after my son died, by giving me something to focus on. How simply and purely happy I was to be there, with them, on a classic New England autumn afternoon at Heath’s Bridge. 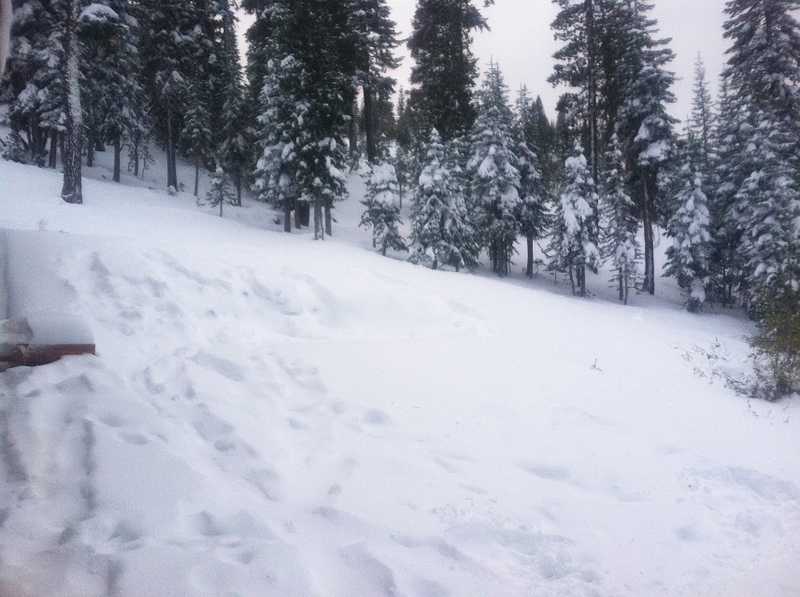 This picture sent from a friend this Monday afteroon in Truckee, California. It’s not the East Coast. Not yet, at least. Nearly a foot and half of snow to kick off the winter season. Although folks are presently snowed in. In Boston, it was a balmy 60 degrees, picture-perfect fall day. I’ll be rollerskiing a while longer yet. Is hasn’t taken long since the delivery of USADA’s “Reasoned Decison” for all of Lance Armstrong’s cycling friends and sponsors to abandon him. First Nike (after some pressure), then Trek, Radio Shak, Anheuser-Busch and finally, following today’s announcement, Oakley. So it came as little surprise today that l’Union Cycliste Internationale (UCI) would choose not to pursue arbitration and would uphold the proposed bans. Subsequently, Armstrong will be stripped of all seven Tours de France victories as well as numerous smaller results that would have made a substantial career for just about any cyclist out there. Perhaps not so much. The UCI has taken advantage of the anti-Armstrong backlash to make the point, “Armstrong has no place in cycling.” The real work could have been done by the UCI years ago when the first rumours of doping by Lance Armstrong and US Postal Service surfaced or when Floyd Landis tried to come in from the cold. Instead, there is evidence that suggests the UCI covered for Armstrong for many years. Had the Armstrong case gone to arbitration, these details might have come out and a brighter light might have shown the festering disease within the UCI. But it’s not over yet. Johan Bruyneel has chosen to go to arbitration. If there’s one guy who, if he goes down will take the whole lot with him, it’s Bruyneel. Stay tuned. I carry with me the dead. Their names are written on small, folded pieces of paper and tucked into jersey pockets. Or etched in Sharpie into the soft skin of my forearms or the backs of my hands. Their images are taped to my handlebars or my ski poles. I have never been asked to this; nor have I volunteered. It is a simple fact for me that it must be done. There is no choice. It is not easy to carry this precious cargo. Their weight is noticeable. But rather like the keel to a sailboat, it provides stability. So my pedal strokes are resolute. My foot strikes are solid and measured. My pole plants are powerful and uncompromised. I have nothing to offer but strength and sacrifice, although I don’t know what difference it will make. I offer it, and more, all the same. I suffer because I believe that it will ease the pain of others, a law of conservation of grief. But the real reason I do this is selfish, not some existential balance of forces. Without it, my own grief would lay dormant, beyond detection, to fester and grow. It would take me over, prevent me from getting out of bed, confuse my thoughts, draw off all of my energy. It would stop me in my tracks. Momentum does not mean forgetting. There is but one direction to go. A few weeks ago, I suddenly lost a friend and co-worker. It devastated his family. I took me back to my own darkest moments. From the memorial ceremony on a farm bright and warm with early autumn sun, I carried his name with me to the city and the cool breeze off the water. I lined up to race the Boston Mayor’s Cup, with his name and the names of the dead folded into my jersey pocket. I went deep because there was no alternative. Sitting up was not an option. Quitting was not an option. Getting dropped was not an option. I would ride until my legs and body failed me – which they nearly did – or until my penance was complete. When I crossed the final line, I was exhausted, laid bare, vulnerable. I was unable to hold back the tears, powerless against the sobbing, with neither the energy to control it nor the voice to explain it. I knew I would recover from this place because that is what I had to do at the very beginning, now so many years ago, when I lost my own son. I knew I would recover because I have done so every time since. After the race, in the dark of night, I dropped into a votive candle the crumpled, sweat-soaked paper containing the names of the dead. It flared briefly then became faint, failing. As the paper absorbed the melted wax, it came to life again, uncurling. The flames danced around and up the sides of the glass, burning with a dazzling white light, popping and skipping, until finally, exhausted, they settled to a gentle slumber. I’ve been slowly making my way through USADA’s “Reasoned Decision” in the Lance Armstrong and US Postal Service doping case. So far, there is nothing “new” here, save an increased level of detail and credibility to stories that have been public for over a decade. Even so, it’s still unsettling. It seems everybody in the cycling world is writing someting about this and most will have more or better things to say than I. My comments will be brief. 1. I was extremely pleased to see USADA publicly release their dossier and all the supporting data when transmitting it to WADA and the UCI. I had feared that it might have been communicated confidentially and that the UCI would find some pretext, however slim, to discard the recommendation out-of-hand and bury the truth for a while longer yet. Now, if nothing else, the public can form an informed opinion on whether or not Armstrong doped. Frankly, there should be little doubt left. 2. It DOES matter that Armstrong doped, cheated and cajoled his way to unprecedented victories. It is no longer sufficient to claim ignorance, or that Armstrong is a scapegoat, or that “everybody was doing it” at the time. It matters to me, in large part, because Armstrong was the face of the sport for much of the world. And I don’t want him as the face of my sport. It matters because he did not do it alone. At long last, the teammates, the drug purveyors, the doctors, trainers and directeurs sportif are being held accountable for creating and promoting a culture of doping. It matters because companies like Nike, Oakley and Trek made millions from their sponsorship relationships with Lance Armstrong (while making him rich, too) and they are now complicit in his abuse and fraud. 3. Lastly, I think the real victims of Lance Armstrong and his drug-fueled doping crew aren’t all the clean riders, but rather the cancer patients who were offered a false idol in the form of Armstrong. They were not able to cheat their way to success the way he did. Maybe they don’t care and maybe, for them, especially the ones who have passed, it doesn’t matter that he doped. While Livestrong may get credit for all they’ve done for cancer research, they are not exactly the organization they claim to be. Just as Armstrong is not the athlete he claimed to be. I’d like to see Lance step up and own the truth. Now.